The Mighty Metropolitan route will make massive moves over meadows and most of the park in this meandering mega loop. 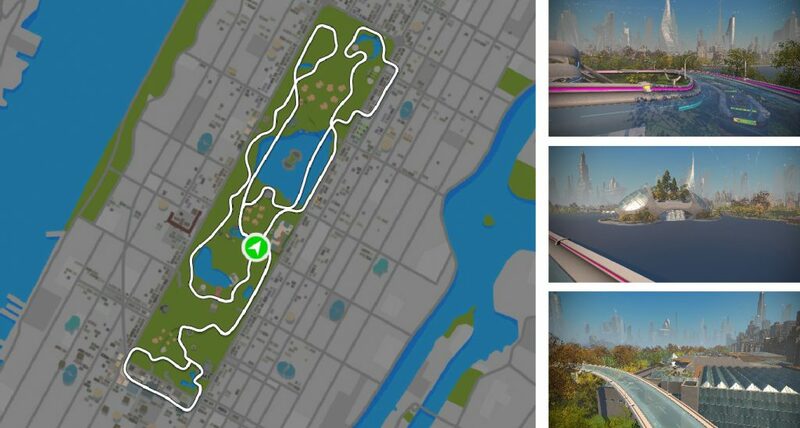 The route makes good use of the futuristic sky roads and classic roads that cover all of Central Park up high and down, low delivering grand views of the Mighty Metropolitan that is Zwift’s NY. This route is one of the longer loops in NY and makes for a pretty tough ride. Here’re a few of the great landmarks on this route. The route starts by passing the largest museum in the US, the Metropolitan Museum of Art. “The Met” happens to be the biggest single structure in the Zwift NY map, which was never the plan, but it gives you an idea of the footprint size of the real thing. Museums aren't typically known for their party environment, but if you look closely you’ll notice that Zwift has brought the party. Find this on the “Above the Met” road. There is nothing more striking than the subways in the sky that we decided to add to Central Park. They traverse the entire park and bring elevation to an otherwise flat park. The sky roads help keep Zwift NY connected and allow you to climb above and through skyscrapers. Keep an eye out the NY Trams that have left the underground and use the sky roads. The Jaqueline Kennedy Onassis Reservoir or more popularly called the Central Park Reservoir is the biggest body of water in the park covering 10 blocks from 86th to 96th street. Having such a pool of water is certainly calming and needed in a hectic city, but we wanted to add something to it to make things more interesting for runners and cyclist so they have something to look at from the many roads the pass by. We wanted to bring in more trees but keep the futuristic element. Mixing metal, concrete, and nature was the plan. A balance of current, natural and futuristic in-one was created to be bold but blend in with its surroundings. We call it the “Manhattan Megadome. The finish to the stage, you need to ascend Cathill Climb, aptly named because of the bronze panther that lives on the rock overlooking the sprint line judging your power output. Don't worry if you mistake it for a real cat, real-life designer Edward Kemeys intended the feline to look real and blend-in. If you’re ever in Central Park, you’ll know where to find the officially named “Still Hunt” panther monument. The NY KOM Reverse Climb segment starts after the KOM Forward segment after an initial climb and a right turn onto the Reverse KOM Arch road.